change the word: book review: jackpot! Frankie Jacobson's friends give her a better chance at winning the lottery than of getting grandchildren any time soon. In Jackie Pilossoph's Jackpot!, she sets out to accomplish one after doing the other. Frankie's son Danny is a struggling actor/Chicago teacher more interested in getting his big break than in settling down any time soon -- if ever. His younger sister Jamie is divorced and about to get engaged to a man she doesn't love, while working as the lottery announcer at a local TV station instead of writing screenplays. But after Frankie picks winning lottery numbers, she creates a contract with her children: give her a biological grandchild within one year and $8 million. Suddenly, Danny and Jamie go from commitment-phobics to baby-crazed as they set out to earn their money. Equally funny and emotional, the story took unexpected turns as Danny and Jamie are willing to do almost anything for their money. Uniquely told from multiple perspectives, the first-person narrative stands out. Though seemingly selfish from the get-go, Pilossoph excel at making Danny and Jamie relatable and likeable. The story's other characters -- from Jamie's doorman to her crushable love interest and Danny's pretzel boss and special lady -- are well-presented and help carry the story. The romance is unexpected for Danny and Jamie, which makes it all the more entertaining. Most importantly, the story carries an important message about love and family. In the midst of their obsession of finding partners to have a baby with -- and then setting about the business of making the babies -- Danny, Jamie and Frankie all learn valuable lessons about what matters most in life. And it isn't about money. 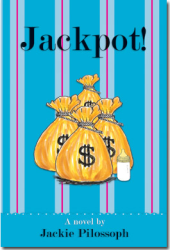 An enjoyable and fast-paced story, Jackpot is well worth the read.